So wrote George Peabody, the Massachusetts born philanthropist, in his Founder’s Letter of the Peabody Institute of the City of Baltimore in 1857. Peabody’s endowment came in appreciation of the “kindness and hospitality’ shown him by the citizens of Baltimore during his early career in dry goods and trade. It was the fortune he eventually made as a financier and banker in London that allowed him to become one of America’s most important early philanthropists. Begun in 1860, the library collection now contains more than 300,000 volumes largely from the 18th and 19th centuries. Notable collection strengths are archaeology, British art and architecture, British and American history, biography, English and American literature, Romance languages and literature, Greek and Latin classics, history of science, geography, and exploration and travel. We continue to add books to the collection. 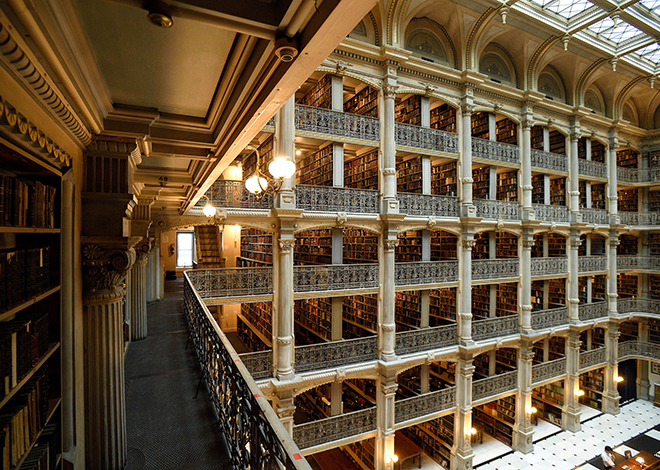 The George Peabody Library, in keeping with Peabody’s original gift, is free and open to the public. Today the library is part of the Special Collections Department of the Sheridan Libraries of Johns Hopkins University. It is a non-circulating collection, but readers and researchers are welcome to use the collection. The collection can be searched online using the search in the top left of this page. You can also browse the library’s pioneering printed catalog, Catalog of the Library of the Peabody Institute. Issued in 1883 and 1896, these detailed dictionary catalogs described books as well as articles within journals held by the library. Visitors are allowed to take photographs of the Library, but we please ask that you be courteous of patrons. The library is a closed-stacks facility; visitors are not permitted upstairs for their safety and the safety of the collection. The iconic building, which opened in 1878, was designed by Baltimore architect Edmund G. Lind, in collaboration with the first provost, Dr. Nathaniel H. Morison. Renowned for its striking architectural interior, the Peabody Stack Room contains five tiers of ornamental cast-iron balconies, which rise dramatically to the skylight 61 feet above the floor. The ironwork was fabricated by the Bartlett-Robbins Company. The architecture of the Peabody Library is discussed in James D. Dilts and Catharine F. Black’s Baltimore’s Cast-Iron Buildings & Architectural Ironwork (1991). Peabody 360Explore a virtual tour of the George Peabody Library.